The next first-team boss will need a thick skin! Dave Robertson with Darren Ferguson. 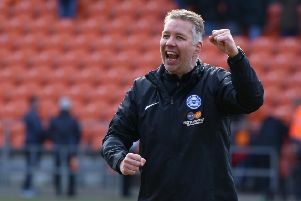 Former Posh boss Darren Ferguson reckons a thick skin is essential for his eventual successor. Ferguson delivered the first media interview since his departure from London Road in February to BBC Radio Cambs this week. He described Posh chairman Darragh MacAnthony as a ‘difficult man to work with’ because of his ‘intense’ nature. But he also insisted that the next Posh manager couldn’t have a better boss. Ferguson said: “Darragh can be a very difficult man to work for because he is so intense. “He is not afraid to voice his opinion so the next manager will need a thick skin. “Darragh knows what he wants and his passion and love of his football club are what drives him on. And that is a compliment to him. “He is also an incredibly supportive chairman. He is not a man who acts on impulse, he is very methodical and he likes to think things through before coming to a decision. “He usually makes the right decision for his club as well. “I’m sure he found it hard to let me go when the time came, but he did it because he knew it was the right thing for the football club and I couldn’t argue with him. “When we lost after such a poor performance at MK Dons he felt it was the right time for a change and he was right. “There are no hard feelings between us though and we are meeting for lunch when he flies into the UK at the end of the season. “When Peterborough won their first game after I left I sent him a text of congratulation and he appreciated that. “He obviously has a big decision to make regarding the next manager and I know he will be keen on someone who can keep the club’s current identity intact. “Obviously winning games will always be important, but we agreed that we wanted to win playing in a certain way. “We also wanted to bring our own young players through and I think the new manager will have to go along with that. “I have deliberately kept away from the club since I left because I didn’t want to put any extra pressure on the lads that came in after me. “They did well for a while, but the inconsistency that affected us all season came back again. “I never felt we were going to be relegated this season when I was manager, but the quality wasn’t there compared to previous seasons. “I won’t be coming back though. I aim to return for pre-season training somewhere as I’ve had a few offers.